Google’s messaging app, Android Messages is about to get a lot more useful and appealing with new features such as integration with Chrome OS, a Material Theme-based redesign, and a dark theme. 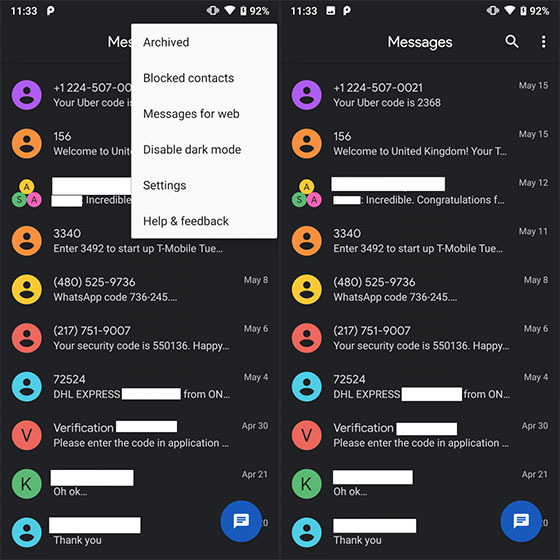 While the dark theme has already been added in this update (but not activated for all users), the other two features are expected to make their way to the app soon. These features were discovered by XDA Developers through an APK teardown of Android Messages. First off, the dark mode is pretty neat and gives a dark grey background to the SMS app. Some of the elements are still left behind and use a light background, which leads to an inconsistent theme. These elements include the pop-up menu which opens when you long-press on a conversation or when you toggle the three-dot menu on the top-right. We expect Google to polish off the rough edges over the future updates. The feature is supported in the latest update but there is no direct feature to enable it and it appears that developers at XDA manipulated the APK to switch it on. Integration with web browsers such as Chrome and Firefox was recently added to Android Messages and it might soon receive support for integration with Chrome OS. This would be integrated as part of Google’s “Better Together” and the company’s efforts to master RCS messaging with its app, Chat. XDA has dug out evidence in the latest APK which strengthens the possibility of the feature being added into Android Messages. There is not much detail about the feature and whether it will work via a web-based client or if the integration will be deeper than just a Chromebook app.